Today, my husband and I went on a "road to Hana" bus tour in Maui. 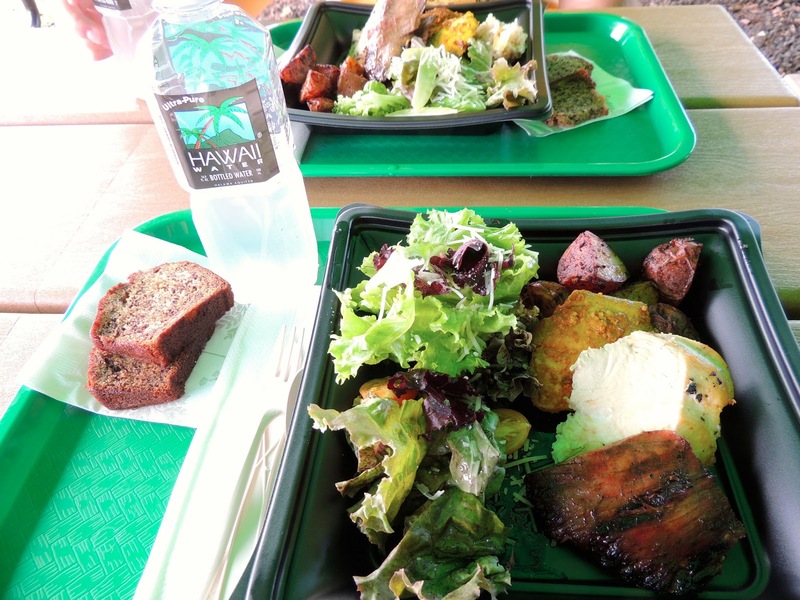 Lunch was included at the Hana Fresh Farm Market. There was an all-you-can-eat buffet set up. We were each given banana bread, and then we helped ourselves to a make-your-own-salad. There were roasted potatoes, brown rice, wilted veggies, fish cooked with turmeric, chicken, and flank steak. To drink, there was sweet tea, water and coffee. 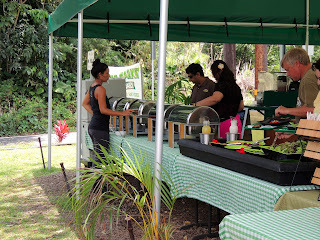 My husband and I made our selections, each choosing to try all of the meats. First of all, the banana bread was good. I grew up eating banana bread that my mom made, and I have a couple awesome banana bread recipes of my own, so I wasn't overly impressed. I'm used to banana bread, but we are in Maui, and they do grow bananas here, so I understand why they serve it everywhere here. It was moist and good and one of the best parts of the meal. The salad options were acceptable. They had leaf lettuce, Parmesan cheese, basic veggies, tomatoes and 2 salad dressings, buttermilk ranch and champagne vinaigrette. I went for the vinaigrette. I didn't try the rice or the wilted veggies, but my husband did, and in his words, "it was okay but nothing to write home about." My absolute favorite part was the potatoes. They tasted like they were soaked in butter. As far as the meat, I think of turmeric as a seasoning usually used for Indian food, so I was expecting something spicy and well seasoned. It was very bland. The chicken was even blander. I don't know that it was seasoned at all. The steak tasted like it was soaked in soy sauce, and my wimpy plastic silverware could barely cut through it. I like meat pretty well done though, so some people were probably even less satisfied than I was. Needless to say, we didn't go back for seconds. 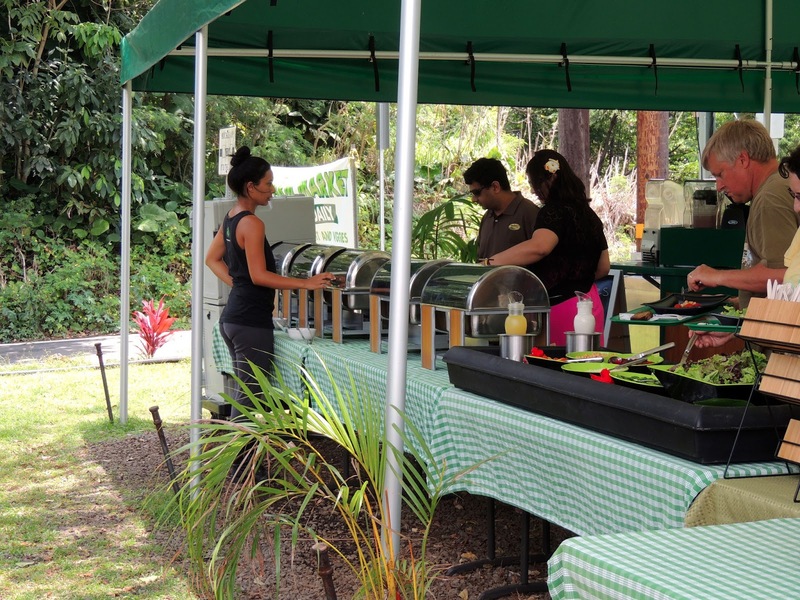 If you go to Maui and go on a "road to Hana" bus tour, this is probably where you'll have lunch. Just know not to get your hopes up. Fresh doesn't always mean delicious, although it can if it's well cooked and well seasoned.